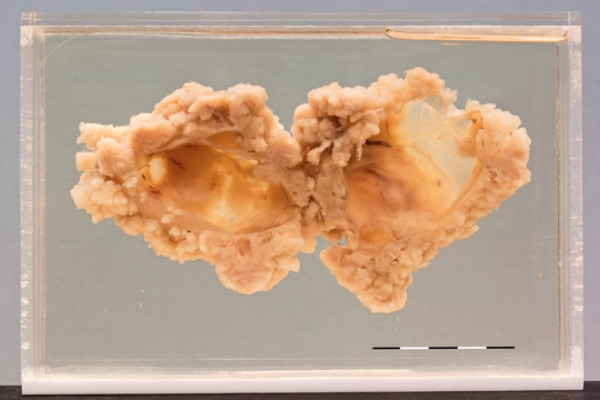 An operative resection specimen from a 59 year old woman admitted to hospital for a prolapsed uterus. The abdomen had become very distended with fluid in the past few weeks and she had lost weight. When the prolapse was reduced, hard masses could be felt in the Pouch of Douglas and a diagnosis of malignant peritonitis was made. At laparotomy many pints of fluid were drained off; the peritoneum and omentum was studded with secondary deposits of growth. Both cystic and papilliferous ovaries were removed for biopsy. After operation the prolapse remained reduced. The masses in the Pouch of Douglas gradually became smaller. She put on weight and had no recurrence of ascites. One year after operation she was alive and in good health, but a year later was found to have a recurrence.